Are you aware of complete barah maha sung in Tukhari???? These are one of the best Shabads in raag Tukhari I have ever heard. I would like to know if you have any plans to present Raag Sorath, Ramkali, Puriya, Kedar and Shudh Kalyan any time soon. Many thanks for a wonderful service. I am not aware of the complete barah maah sung in Tukhari. That would be wonderful. 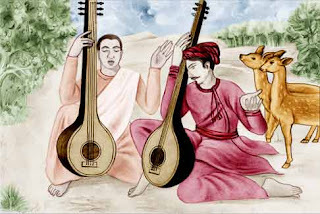 There are a couple of pages on this blog with a lot of raag-based shabads. I will likely have more in the future in various raags. Please add Kirtab in Jai Taal 13 Matra .. More is coming soon. Also it would be great if you can recognize the name of Ragi Singh. Thanks for your link. I will add it to the Basant collection in the next Basant update.